Welcome to WTOP's breakfast blog. Each week health reporter Paula Wolfson will explore the ins and outs, the dos and don'ts of breakfast. Low fat or no fat? All smoothies are healthy, right? Wait, I can't eat sausage anymore? Breakfast is complicated. Join us as we tackle all your breakfast questions and help you navigate the many hidden pitfalls of the most important meal of the day. Share what lands on your plate or in your bowl and our panel of local nutrition experts will analyze your choices and offer healthier, quick, even easy, alternatives. Just click on "Make a Comment" below to ask a question or post a comment. Leave a message on the WTOP Talkback line at 844-282-1035 or send us an email to talkback@wtop.com. There is no physiological reason for eating 80% healthy and 20% unhealthy. There only possible reason for such a rule is psychological. It is a helper rule for dieting instead of a commitment to a healthy lifestyle. As most of us know, dieting is a war that cannot be won. 20% becomes 25% becomes 45% until you get disgusted and then cycle back creating a dieting yo yo. But all of this goes to someone who is concerned about their health. If you are eating bacon, then you don't care about a healthy lifestyle or diet. Eating highly processed meat stuffed with nitrates, fat, and salt is not good for you. Duh. Yet you eat it anyhow. Recognize the choice you have made. There is no scientific evidence that eating *any type* of cholesterol can impact your blood serum cholesterol. In fact, one way to reduce blood serum cholesterol is to eat a low carbohydrate diet (though most people find this difficult to maintain for more than a few month or years). Now research into the gastrointestinal microbiome has identified a microbe that can produce toxic compounds from eggs. So it is entirely possible that an unbalanced microbiome can reduce the general nutritional value of eggs. We are still early in the process of identifying microbiome based issues and fixing them. Error in the side of caution when it comes to eggs. The egg industry often tries to put out information to try to refute the science. Do your own research and don't rely on blogs for your information. I can write a blog and say what I want but it does not make it true, no matter how famous of a blogger I am. Be your best advocate for your health and put in the time. Your health is worth it. I also recommend this book by Dr. Essylsten M.D. from the Cleveland Clinic. His book reversed a manager at my companies heart disease. After following the diet for 8 weeks when he went for surgery they looked through his artery with a camera they found the blockage gone. The artery was blocked 75 percent before the 8 weeks. This week, we are talking smooooooooooothies. I love them in the summertime when the heat is on. Throw in some spinach, frozen banana and mango chunks, a little protein powder, maybe a drop of flax oil and some coconut water in the high-powered blender and let 'er rip. I keep it pretty simple. Stephanie Marcus posted her recipe below, and it is a bit more complex, though packed full of vitamins, minerals, protein and all the other good stuff your body needs in the morning. The bottom line, though, is you have got to be careful about smoothies. They can turn into real calorie and sugar bombs -- especially the ones that are commercially made. 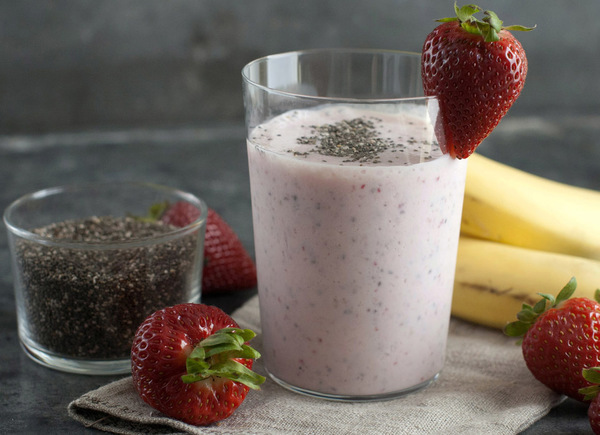 "You have to have some smoothie smarts," says dietician Lauren Trocchio. She says before you buy one, really read the ingredients list. If a smoothie is going to be your meal, it has got to be balanced and include protein, fat and carbohydrates -- just like the one Stephanie drinks. Make it at home like Stephanie and you are in control! I use protein powder; she adds Greek yogurt. But you can throw silken tofu or even cottage cheese into the blender. And here's a tip from Lauren, who is quite the athlete herself and a bit of a smoothie expert: Try putting a few slices of avocado in your smoothie. It's a healthy fat that works sort of like tofu, taking on the flavor of whatever else you add and making the whole concoction smooth and creamy. And isn't that just what you want from a smoothie, anyway? Pound of bacon, pound of Crisco, brick of cheddar, quart of heavy cream, one organic-free-range-cage-free blueberry. People didn't spend a million years evolving to go back to eating leaves. @Paul That sounds divine! Perfect way to start the day. How soon after waking should breakfast be eaten? @WTOP I always have the right balance of carbs, fat & protein in my breakfast. Ex: steel cut oats, blueberries, turkey bacon & egg whites.???????? A cup of red quinoa with a little butter and a sprinkle of sea salt and a clementine. The challenge with breakfast is time. Like lunch, the amount of time for the meal is limited. Try preparing an omelet 5 days in advance. Yuck! Fast options like yogurt and oatmeal are common choices, but not very tasty. Would love some suggestions for items that are healthy, inexpensive, fast, and tasty. Steel cut oats with raisins and coconut/almond milk. Great article on breakfast, but you might note that recent medical studies show that breakfast is actually no more important than any other meal. One grapefruit and a 3 egg, spinach and cheese omelet seven days a week. today's breakfast was Kushary. Lentils, small elbows, rice, onions, garlic, collard greens, smoked turkey, hot peppers, and a splash of crushed tomatoes. Skipped the crispy fried onion topping, too much fat. A lox and cream cheese spinach wrap this morning. Usually Cheerios with fresh blueberries or red raspberries. And coffee! A cup of Blackberries, a cup of Raspberries, ½ a Papaya and a Pear with coffee. My go to breakfast is oatmeal heated with skim milk and 1/3 of a banana sliced on top, grape juice, whole wheat toast with low fat peanut butter, and coffee with skim milk. This fuels me through the morning. How about a 2egg frittata with onions and s little cheese with half a grapefruit with a splash of honey and coffee. Most days two boiled eggs and a cup of herbal tea. If I'm really hungry I also add a yogurt. Sometimes an English muffin toasted and spread with peanut butter. I love breakfast, and it is my favorite meal of the day. I, however, am a type 2 diabetic. 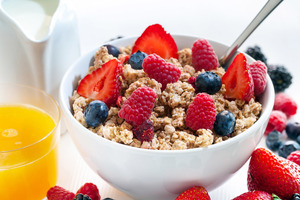 I most often eat cereal, usually Cheerios or Kix or another low sugar added cereal. I also add a high fiber cereal which has no added sugar. Reading labels, unfortunately, most cereals contain approximately 20 –25 grams of carbs. I usually also eat 1/2 of a banana. I add protein powder, flax seed, and cinnamon to the bowl. I also add either fresh or frozen berries. I also eat a slice of cheese, usually Jarlsburg or cheddar. Every other day I make an omellette with whatever vegetable we have. I have pretty much given up toast and juice, however occasionally I will have a slice of multigrain toast with peanut butter. I drink a cup of coffee, no sugar, and a little milk. Yogurt for breakfast does not satisfy my hunger. I also occasionally make steel cut oatmeal and add berries. Any suggestions? I should check my blood 2 hours after eating the above, but usually forget or I am not home. I check my blood before dinner and it is usually with a decent result. Breakfast is great but with all the medical news out there, I've started to become paranoid about what I have. Usually, I'll start with an orange, then move to Fiber 1 cereal with some blueberries, and some Greek Yogurt and/or a banana. Am I a little too quirky?